"I was afraid of raising my arms. I had not won since 2010. This is my 4th victory as a professional. I finished second ten times, like I did here in 2012. I was missing most of my chances to raise my arms." 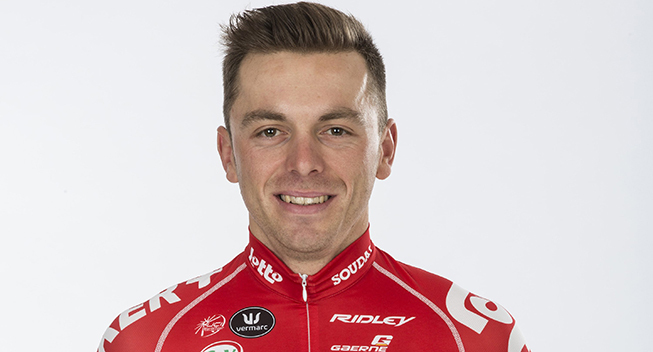 Three days after Pim Ligthart’s win in the GP La Marseillaise, Kris Boeckmans continued Lotto Soudal’s excellent start to their early-season campaign when he won today’s opening stage of the Etoile de Besseges. On a very windy day that saw the peloton split to pieces, he bridged across to a first echelon halfway through the stage and after he joined the right 13-rider break in the finale, he managed to beat his companions in a sprint. "It was a big fight in the beginning of the race," he told Directvelo. "I got surprised by the group of 28 riders that attacked pretty quickly. After the second KOM, I launched an echelon with my teammate Pim Ligthart. We took off in pursuit, about 25 riders. "On the final circuit, there were many attacks. There were riders everywhere. I managed to go from group to group. Finally we were 13 in the lead, three from our team. The situation was ideal for us. Dennis Vanendert and Pim Ligthart attacked, I remained in the wheels waiting for the sprint. I waited before starting my sprint. I made my effort 200 meters from the line. There was a headwind. "I was afraid of raising my arms. I had not won since 2010. This is my 4th victory as a professional. I finished second ten times, like I did here in 2012. I was missing most of my chances to raise my arms. I'm often good early in the season. I finished fourth in this stage in 2013. "I have the jersey but I'm going day by day. Maxime Monfort and Tony Gallopin are our leaders for the general classification. All the classics in Flanders are goals for me this season but I also want to do well at Paris-Roubaix and the Belgian Championships."